Congratulations to Erika Cerritos and Claudet Miranda for winning the JSA Winter Congress Debate. Along with other JSA members, their proposed bill: Raising the minimum Wage of tipped workers and eliminating mandatory tipping, was approved as a law after a two-day Congressional process in Washington, DC, February 22-25, 2018. 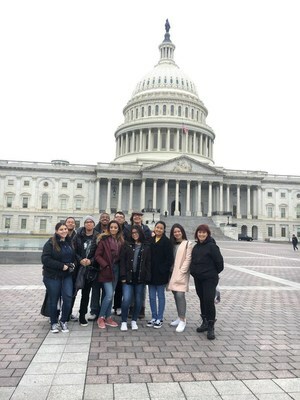 Honorable mention of the achievements of the following JSA Debate members in their subcommittees: Alexandrya Lopez, Sebastian Subia, Destiny Correa, Awni Pimentel, Felix Castro, Amanda Navarro, Giancarlos Castellon, Joel Marte for arguing in support of proposed bills and having them passed in Congress.